What began in London in 1841 by a farmer-turned-drapery salesman on a bent for Bible-study has become the largest not-for-profit in the world open to all people in need. It was during the Industrial Revolution when George Williams came to London Town. Upon witnessing the cacophony of workers living in squalor he opened the first YMCA and offered them prayer instead of misery. The movement came to the U.S. (Boston) in 1851. It has evolved in methodology, but remains true to purpose of mind, spirit, body. Basketball, racquetball, and volleyball were invented at the Y. They formed missionaries, overseas war entourages, ran war canteens, built trade schools and colleges, provided vocational training, camping, medical assistance, assisted prisoners-of-war, helped build the USO. Professional football began at a Y, and softball, once known as sissyball, got its name there. After WWII, women joined, and the focus changed to pro-actively building character through programs that teach the core values of "caring, honesty, respect, and responsibility." The '90s brought a tighter look at offering young people ways to build positive assets through a variety of activities. Today their mission remains the same: "To put Christian principles into practice through programs that build healthy spirit, mind and body for all." Over 2,500 independent YMCAs, plus their branches, dot the U.S. with 27 in New Jersey. Four YMCAs in Northwestern New Jersey are represented here. In addition to specialties, they offer similar basic programs: summer sleep-away camp, summer day camp, group and family camping ­ sometimes year-round, and environmental education for school classes as an extension of their curriculum. In 1900, the independent Camp Ralph Mason in Hardwick began as Camp Washington just north of Trenton, servicing many kids from the Trenton YMCA and surrounding Ys from New Jersey and Pennsylvania that had no camping facilities. Sometime later, Marshall's Island, a privately-ownedprivately owned farmed island in the Delaware River, was put up for sale. Trenton YMCA board member James Wilson purchased the island and gave it to the young Camp Washington, which relocated and became known as Camp Wilson. Then, on August 19, 1955, the idyllic camp in the middle of the river got washed away by the infamous flood that knocked down bridges and killed 90 people. A Princeton attorney came to the rescue. Ralph S. Mason, Trenton Y Camp Chair and ex-counselor who enjoyed his days at Camp Wilson, stepped in to help raise money to buy new property so boys could continue the camping experience. Encouraged by Mason's leadership, the Ys raised $250,000 to buy Dr. Bishop's property in Hardwick, where the camp is today. It was called Central New Jersey Camp until 1956 when it was renamed Camp Ralph Mason. "Camp Ralph Mason is the third oldest continuously-operating camp in the world," says Michael Peterson, executive director. Today the camp is proud of its march through devastating history and boasts special amenities such as Diamond M Ranch Camp, its western riding program. The Adventure Bound Program offers outdoor and wilderness adventure with five-day to two-week satellite-based trips for backpacking, canoeing, white water rafting, bicycling, and sailing. 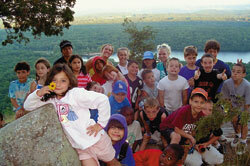 Satellite Camp Ken-Etiwa-Pec is located in the Delaware Water Gap National Recreation Area. At Camp Mason, kids create their own programs by choosing from 35 activities, which includes performing arts. "They build their day based on the activities they want to do," says Peterson. In the early 1900s Colonel Austin Colgate, of the Colgate/Palmolive family and a member of the Y's board Board of directorsDirectors, had owned a summer home near Fairview Lake. He invited city boys to come to the country and enjoy the lake and learn new skills. In 1915, when he realized these activities gave them new skills and positive values through role modeling, he bought up as much lakefront property as he could. From 1915 to 1927, camping on Colgate land was common practice for boys from the city. "He wanted young men from the Oranges to have a place to go and grow," says Jenny Griffin, conference director. Upon Colgate's death in 1927, the property was formally bequeathed to the YMCA. "That is why today we are able to have 600 acres," says Frank Kelly, executive director. Over time, three Boy Scout camps closed and FairvewFairview snapped them up. When the camp first opened, it was called "Orymca Camp," because it served boys from West Orange. Camp Kittatinny for boys opened in 1915 on the shore of Fairview Lake in Stillwater as the first YMCA camp in Sussex County. 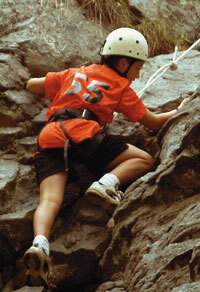 Its success led to the opening of Camp Minisink for younger boys age 7 to 9. Both camps are part of Fairview Lake Camps and Conference Center, a branch of MetroYMCAs of the Oranges. From the start and for a long time, Fairview's programs centered aroundon the outdoor setting and activities that kids couldn't get in their daily lives. Summer on a lake made visions seen in magazines and movies come alive ­ sailing, paddling a canoe, using a bow and arrow. Over the years other programs were added as they became popular like inline skating. "Other kids, you can't keep them out of the water," says Kelly. "Over the course of time, the activities changed a little bit, but being busy with your cabin and your counselor, and being at a fire and telling stories hasn't changed. The basic premise is to help kids build self-esteem and self-confidence, and help them build interpersonal skills. If a child feels better about himself he'll have a better understanding for making and recognizing the difference he can make in the lives of all the people he interacts with." The 600-acre camp contains a 110-acre lake where kids windsurf, sail, swim, fish, canoe. Fairview Lake YMCA Camps is composed of three units: Camp Minisink for boys and girls ages 7 to 9, Camp Kittatinny for boys age 10 to 15, and Camp Laurel Ridge for girls age 10 to 15. Blue Mountain Day Camp, of the Sussex County YMCA, is another branch of the Metro Y located at Fairview Lake. Special theme events round out the sleep-away experience such as "Color War," an expanded Olympics that started in the 1930s when the camp split into two teams competing in various sports for 48 hours. In Environmental Trips for Challenge program, kids backpack, rock climb, and go caving and river-canoeing for a week or two. Nature-oriented Family Camp happens in fall through spring when individual families or groups of families stay for the weekend in heated cabins. "The idea is that the family makes the decision to take the time to be together," says Kelly. "Families get a sense of belonging to the family camp group. Family groups may also be part of a larger group, like a church. "Our mission is to enrich the lives of children, families, and the communities we serve through programs that build spirit of mind and body, and welcoming all people in an environment of nurturing positive values," says Kelly. Camp Linwood-MacDonald is a branch of the Newark YMWCA which, oddly enough, began in 1871 as a YWCA when 23 destitute women needed a place to live, says Gloria Magriz, special events coordinator of the Newark Y. Ten years later and across town, a YMCA opened and in 1954, when the women's Y went bankrupt, the two merged and opened in a new location on Broad Street. 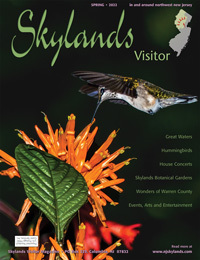 With the push to get city kids to the country, the Newark Y acquired three camping properties in Sussex County: a day camp whose former whereabouts are unknown, Camp Kiamesha (1909) whose stone pillars and buildings still stand on state land in Stillwater, and a camp on Flatbrook Road, now part of Stokes State Forest. Camp MacDonald was a dairy farm owned by John Merring who drowned in the Flatbrook River in 1842 when coming home one evening after milking his cows. A century later, Newark philanthropist Nester MacDonald bought that farm and gave it to the Newark Y. They named it Camp MacDonald. A few years later, in 1959 Margaret Craig Weaver purchased a farm across the road from the MacDonald farm and donated it to the Y, and gave it her philanthropic father's middle name. The other properties were all sold. "Camp Linwood MacDonald was meant to be a conference center. Newark YMWCA is very diverse," says executive director Anne Thornton "Part of their repertoire is to bring people from all walks of life out of the city into the country." Summer day camp for local kids has won Linwood-MacDonald an accreditation from the American Camp Association, a distinction that shows they went the extra mile. As with most other summer camps, they supply the facility, activities, and food and groups bring their own counselors. Perhaps the unique thing about Camp Linwood YMCA Conference Center is the youth boxing program run by ex-boxer and coach Joe Stella as part of the camp's total physical fitness. The program serves eight-year-olds and up through adult. "A lot of kids who come here are looking for alternative physical fitness. Boxing has a mystique," says Thornton, who is raising funds for a separate building just for fitness programs. Today the Newark location supports a hotel largely for college students and international guests (different floors for men and women), an emergency residency center for teens with problems, and a fitness center. Camp Bernie in Lebanon Township opened in 1956 when the Ridgewood Y's camping lease at Harriman, New York, expired. The Y purchased the Hunterdon County 248-acre farm-turned-family retreat and named it Camp Bernie. In the early 1960s, girls began camping out at Camp Bernie. "We were one of the first co-ed camps," says David Parfitt, executive director. Just recently, they added 27 acres to their camping fun. With a capacity for 300 students, the Camp Bernie's environmental education program draws classes from the tri-state area. "It's all about character development. There are scores of activities that teach team building, confidence building, and skills," explains Parfitt. And that includes a stable of 12 horses. Camp is a place where kids feel a little safe. Defenses are down so they can enjoy sharing activities with others. "It's a great place for young people to relax, enjoy, and learn something about themselves and one another," says Camp Bernie's Parfitt. But the big question on everybody's lips is: Can I go too? For a fascinating history or to locate a Y near you click here or call 888-333-YMCA.